J ohn James a West Point graduate stormed to victory in the Republican primary for U.S. Senate this week and will now face three-term incumbent Democrat Debbie Stabenow for the seat November 6 th . His stature in conservative circles has been rising for months and his victory was fueled by an endorsement by President Trump who said James is a future star in the Republican Party. In his race with businessman Sandy Pensler James secured nearly 55% of the vote with well above 500,000 ballots cast for him. Where is the racist GOP we have all been told so much about? 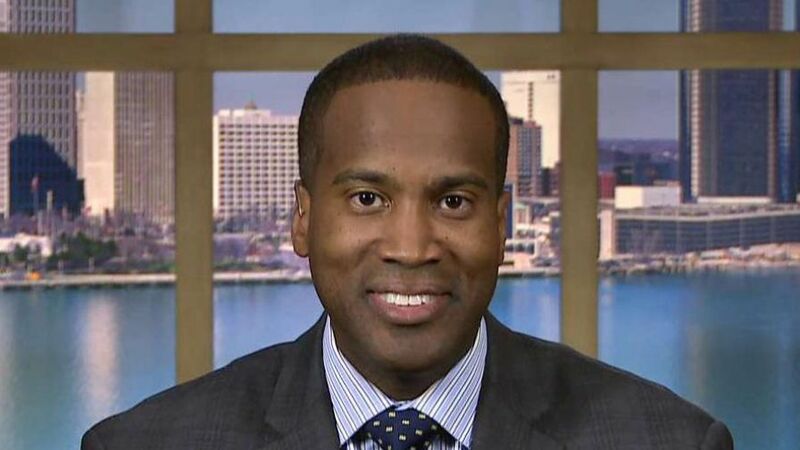 I mean after all John James is an outspoken conservative, combat veteran and notably he is black. The left has been trumpeting a message for a very long time that the President is a racist and is a supporter of white nationalists. How could that be true with his enthusiastic support for John James? It is just as likely that if The President had thrown his support behind Pensler the outcome would have been different but he didn’t. The President lined up to push James to victory in what otherwise appeared to be a toss-up. This should sink the notion of Trump is a racist but of course it won’t and the left leaning national media outlets will simply ignore James impressive victory. In order for James to get more than half a million votes, the majority of those lining up to pull the lever for him were white, that is a mathematical fact. It is a fact that things are changing in many corners of the country and that is not good news for the left. There is a shift happening right now in the political dynamic of America in favor of Trump from people of color. The reasons could be many but in the end it likely comes down to the economy where black Americans and Hispanic Americans have benefited greatly from the economic upturn. This is something that is being largely ignored by the mainstream news outlets. I cannot say whether it is intentional or if those at the New York Times, NBC or CNN are just oblivious to what is happening in places like Michigan, North Carolina or Nevada. Clearly those outlets missed all the signs and sirens of The Trump Train rolling through the 2016 Election. Were they willfully ignorant or just intellectually insulated from the facts in one swing state after another? I am not sure what the perfect answer is for 2016 but I am telling you there is something happening right now across the country in traditionally safe Democratic voting block. There is no better example of the shifting political attitudes than John James, a 37-year-old combat veteran who earned his degree from the nation’s oldest military academy before being deployed in Iraq. When he came home he took over the family business that is now a $125 Million dollar enterprise. James would be the second African American Republican Senator along with South Carolina’s Tim Scott. It is clear that working white Michigan residents are more than happy to vote for him for a variety of reasons. James will also attract otherwise loyal black voters in the Democratic Party. James candidacy and easy win this week highlights the fact that Republicans are more than happy to vote for a black candidate and it opens the possibility that Democrats could cross the aisle to support his as well. Just watch what happens as this election plays out and remember where you heard about it first.